It is believed that metrics teams can only get 80% of the way to an effective set of metrics. The last 20% comes from deploying the metrics, seeing how they affect performance, and then adjusting them accordingly. The same can be said about the performance which these metrics guide. One of the main reasons we measure performance is so that we can identify weaknesses and areas of improvements. What we do once we identify these weakness and areas of improvement is what determines how effective our performance initiative, and in turn, organization will be. The purpose of performance improvement is not to point fingers and place blame on a group or individuals that are not performing well, nor is it intended to solve problems. Performance improvement is simply a way of looking at how an organization can perform better. The difficulty with performance improvement, especially in an enterprise organization, is understanding which processes are working well and which aren’t and knowing what to tackle first when key processes are interconnected. Other challenges of implementing a performance improvement plan enterprise-wide occur when performance management teams try to implement change on a large scale. Performance improvement is best accomplished by implementing small changes, mastering a particular process to achieve those changes and identifying the next change that will lead to further performance improvements. Lifecycle Performance Improvement is an eleven step, systematic methodology for identifying weaknesses and the root causes of performance problems, and implementing a solution that applies to those specific performance deficits. As guidance, focus on results needed by other domains (e.g., products or services needed by internal or external customers). Performance baselines are a good place to start to determine reasonable targets. Ensure that report parameters and formulas are well documented and consistent as these measures are revisited throughout the performance improvement process. This gives you an idea of how much work you have ahead of you. The further the actual results are from the desired performance the greater the performance gap. Some criteria that may be useful to consider are value of metric, organizational impact, ease of implementing improvement measures, time restraints, etc. Often times, investigation of a performance gap will lead you to other weaknesses, which contribute to that gap in performance. In fact, major cross-functional processes are often low performing because of an underlying or sometime unrelated area of weakness. What occurred to create it? What is the significance of the event with respect to customer? Who allowed this condition to exist? Who was supervising this activity? Where (physical location, environmental condition)? How did this condition originate? Once the root cause is determined then it has to be determined whether it costs more to remove the root cause or continue to treat the symptoms. In a performance improvement setting, removing the root cause is preferred, but again, organizational objectives are the main influence on this decision. 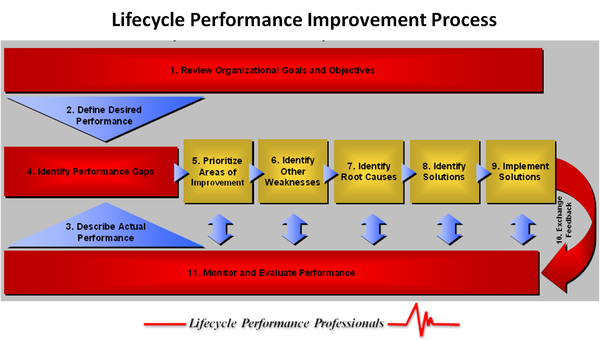 This step involves developing a performance improvement plan based on the organization’s weaknesses and root causes. This is where an organization maps out its plan to achieve the desired results, measures and standards that were previous unattainable. The root cause analysis performed in the previous step should assist identifying the best solution for each performance gap. Well, the hard part is finished. You’ve identified your problems and determined their root causes. You’ve generated numerous alternative solutions, and you’ve chosen the best alternative. If the solution is complicated, or if it requires a lot of work to implement, it might be best to prepare an action plan outlining the necessary steps to be taken. This plan may indicate who is responsible for each action, the target date for completing them, and available resources. This is an ongoing process that is often undervalued. Continuous feedback can sometimes enable an organization to identify root causes long before they become problematic. But remember, feedback can only be effective if the organization acts on some of those suggestions.